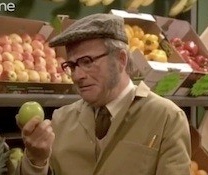 This BBC comedy skit plays on the words Apple, Blackberry and others. It is performed by comedians Harry Enfield and Ronnie Corbett. On this funny note we celebrate SaudiMac English Edition’s 1000th post. Last week we had the Arabic Edition’s 1000th post as well. I’d like to take this quick moment to thank you all for your support.